I'm thankful that I normally have the whole day to cook and plan out my Thanksgiving dinner. However, I know that there are many out there who have to work, or don't have family close by to be with. Or maybe it's just you and your significant other so you don't want to make a big huge meal. Well, here is an easy Thanksgiving dinner for two, in under an hour. You can still have your stuffing, turkey, potatoes, and pumpkin and not stress about being at work or not having the time to cook. The night before or the morning before you eat, soak your turkey in a brine. Mine fit in a 8 c Tupperware with about 4 c of water, 2 tbsp salt, and about 1/2 tsp poultry seasoning. You can also add a couple tablespoons of brown sugar and 1 tsp orange zest for added flavor. This will help your turkey retain some of its moisture while baking. Let soak in the brine overnight or at least for 6 hours. When it's time to bake, turn on oven to 350 degrees. Scrub and poke your potatoes. When the oven is ready put them in. These will take the longest to cook as they will take about 30-45 minutes. Read the instructions on your stuffing and follow the directions for two servings. Mine called for 1/4 c chopped celery and 1/4 c chopped onion. Melt butter in pan and sauté onions and celery until almost soft (about 5 minutes). Add the stuffing (for 2 servings) to the butter mixture (my stuffing called for 2 cups of the mix). Mix well. Mix 1/4 of the can of turkey gravy and 1/2 cup of water and add it to the stuffing mixture to moisten it. Spread 1/4 of the can of gravy on the bottom of a 13x9 baking pan. Place the turkey breasts on top and rub with poultry seasoning and salt. Zest 1 tsp of the orange over the chicken breasts. Pour the rest of the 1/2 can of gravy over the turkey breasts and then top it all off with the stuffing. Cover with tin foil and place in oven for 30 minutes. My turkey breasts were thin so they were definitely ready by then. If you need to, then insert in a meat thermometer and cook until the temperature reaches 165 degrees or the juices run clear. If you want the crispy top of your stuffing, then remove the foil during the last 10 minutes of the cooking time. *IF you want an entire pie, this recipe will fill 1 deep dish pie crust (plus a ramekin or two, ) OR 2 smaller pie crusts. My favorite prepared crust is Mrs. Smiths frozen deep dish. Just keep in mind that it will push you over the hour limit, but put the pie in the oven when the potatoes and turkey come out and you will be able to smell the pie cooking while eating dinner. Directions for entire pie: Increase the temperature to 425 degrees. Put pie in the oven and after 15 minutes reduce heat back to 350 degrees. (without opening the oven door) Continue cooking for about 30 minutes or until a toothpick comes out clean in the center. ** A quick note about my pumpkin pie recipe. This is my mother's and I grew up with this one my whole life. However, it does not have that major pumpkin flavor. While it is definitely pumpkin, all the added spices and molasses makes it more of a gingerbread flavor pumpkin pie. But I love it, because I'm not too keen on the whole squash flavor of pumpkin by itself. 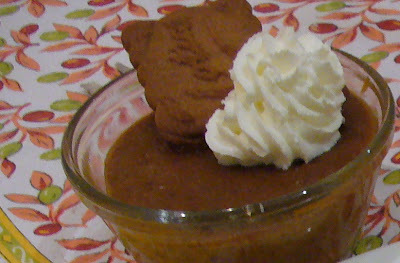 If you're just using the ramekins, then when ready to serve, add some whipped cream and a gingersnap cookie, if desired. While the pumpkin custard and the turkey are cooking, prepare your salad, set the table, pour your cranberry jelly into a bowl (heat if desired), and then relax until the timer goes off. When your timer goes off and everything is cooked (test temperature of turkey and clean toothpick in pumpkin) then remove it all and prepare to eat. 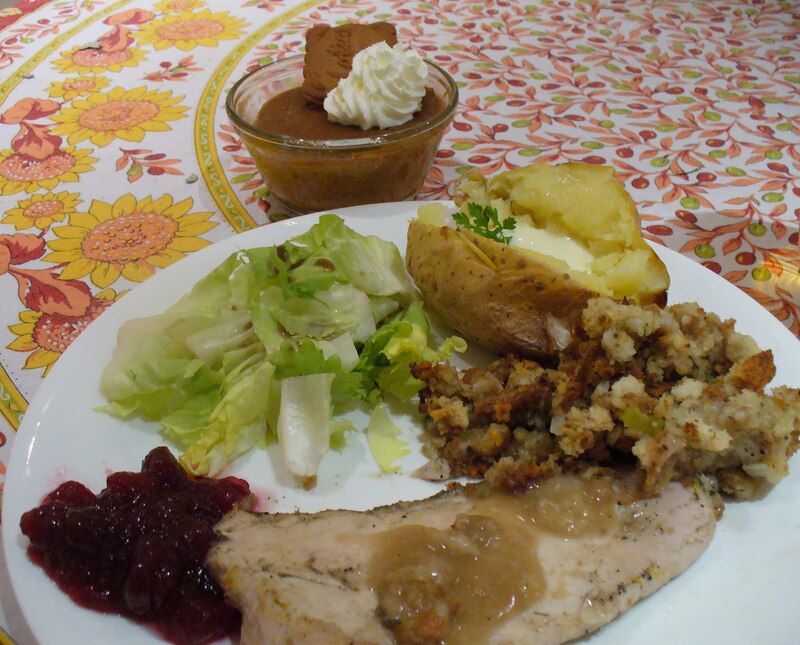 In one hour you have made two turkey breasts cooked in turkey gravy, with stuffing, 2 baked potatoes, salad, cranberry sauce, and a bunch of little single serving crust-less pumpkin pies. No stress. Not a ton of clean up. And plenty of time to spend with your loved one, your friend, or your football game.